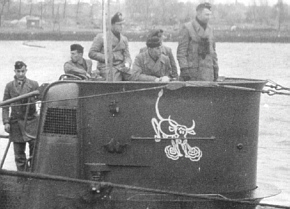 The original snorting bull and the version seen in photos of the boat returning from its sixth patrol were both applied at sea. The boat may have been rolling around in the North Atlantic or North Sea as the crewman hastily applied the white paint. Rain, wind and spray may also have hindered the crewman as he attempted to produce the best he could in the circumstances. In comparison, the three final snorting bull versions were applied during refits in port. As we would expect, these versions are much neater renditions of the famous insignia. The boat in refit certainly made a rather more stable platform than a boat in mid-patrol. With far better conditions and more time available, the reproductions of the snorting bull were much better than the bulls we have seen in earlier photographs. Thankfully a number of photos of U-47 late in her career are available to us. Some of these photos provide very good views of the insignia during this time period. This has allowed the final three versions to be drawn and compared. One difference between early and late bulls is that the hoof of the other hind leg can be seen underneath the body of the later bulls. Another difference is in respect to the tail: the early bulls had a straight tail while the late bulls had curved tails. The later bulls were also applied upon a darker grey background (Schlickgrau 58 rather than older Dunkelgrau 51). As a result of this paint colour change, the white bulls stood out better against the darker background. the end of the right hoof is below the end of the left hoof. 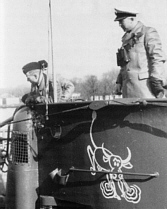 Left: The starboard bull during the preparations for departure on the eighth patrol, which started on 14 October 1940. The bull appears directly in the middle of the railing bar, as it also does in later versions. By comparison, the earlier bulls were located slightly father back on the tower. Right: A schematic of the eighth patrol bull. the end of the right hoof is above the end of the left hoof. Left: The starboard bull at the start of the 9th patrol on the 3rd November 1940. Note that the body of the bull is at less of an angle when compared to the other bulls. 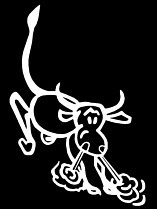 Right: The Snorting Bull insignia at the start of the ninth patrol. 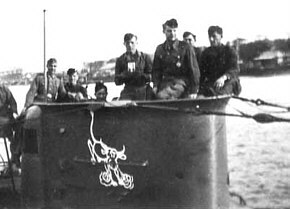 Left: photograph of the final version of U-47's starboard bull as at 20 February 1941 before U-47's tenth and final war patrol. Right: A schematic of the final bull emblem.